Exclusive! Sleep peacefully under a starry sky! 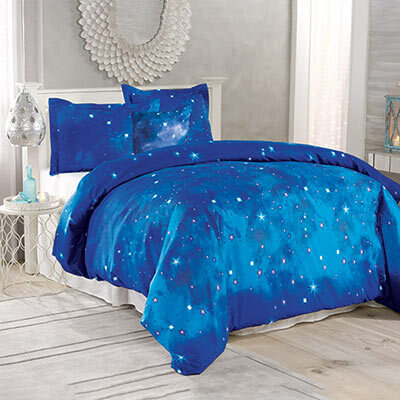 Super-soft and easy-care polyester microfiber, this universe-inspired Celestial Dreams duvet set and accessories are perfect for all seasons. Button closure. Machine wash. Imported. 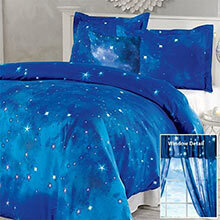 I have several microfiber duvet covers and pillow cases, that are absolutely wonderful to sleep under. However this one is just a coarse polyester fabric, not soft on the skin and it does not breathe well. I love the pattern, and had hoped with washing it would soften, but it did not. I already threw away all the packaging and return instructions, so, I am stuck with an item that at best I can donate to Salvation Army. I love this duvet cover and the only thing I don't like is that I was not able to buy the curtains at the same time and now they are out so, I bought another duvet set so I can make my own curtains and have extra material to make extra stuff, like a seat cover for my make-up bench. I can't tell you how great it looks with the different colors of blue and just enough violet to make it look like a lovely ski with the stars shinning bright! I love this blanket cover and pillow shams and it looks great with the stars all over and a little purple streak here and there, I am doing over my bedroom am this is a good way to do it, nothing was wrong with my blanket I just wanted a new look, I'm just very sorry I didn't order the drapes at the same time as they are now out of the drapes. It is not easy being on a budget.